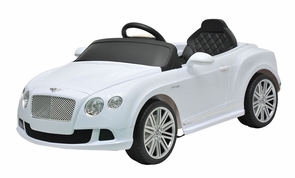 Get ready for the most exciting Magic Cars™ Bentley ride on RC car for children in white, black, or pink. Yes, your child can really ride inside this Bentley car. Perhaps you drive or dream of a full size Bentley, but this car is perfect for children and everyday. Buy from TrendTimes.com, your #1 Bentley toy experts. Plus, you can tell your child, "Hey, be nice, I bought you a Bentley for your first car". Comes with seat belt, working car sounds, working lights, carbon fiber style steering wheel, authentic Bentley floor mats, and real Magic Cars® Bentley keys for added realism. Your child or loved one can drive forward, backward, left, and right. The coolest part of this Bentley ride on car is that parents get a fully functional wireless remote control to take over control and direction of the car. Maybe, you have a young driver that cannot reach the pedals? Or you just want to have fun driving the car with your child inside it. Either way, this ride on car is amazing and the solution to all of your problems. Great for ages 1-5. Do not be fooled by imitators, only official Magic Cars® sold on TrendTimes.com come with the Best In Class 1 year bumper to bumper warranty for free! Please order today as this car will be sold out before Christmas. Ride inside the house or outside in style. The included powerful 12 volt motor and 12 volt battery will have you riding for years. Reach speeds of about 5 mph. Choose from Bentley white or black. Want to let your child control the car instead? No problem, flip the switch in the car and the young driver gets full control. Watch the official Trend Times Magic Cars® remote control ride on RC car commercial below and enjoy what is so amazing today. Buy this car and you will feel like the entire family just bought a full size Bentley to enjoy.